I like the street art in Barcelona. It adds vibrancy to the city and some of the building pieces are truly amazing. And when the shutters are down I much prefer seeing an amusing piece than a boring metal shutter. 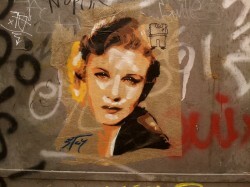 I take photos whenever I can and post them to my Barcelona street art Pinterest board. Katrine Knauer likes the street art in Barcelona too. She runs a group on Facebook and a website called Mapping Barcelona Public Art, ‘an ongoing project to promote the understanding and protect the freedom of expression on the streets of Barcelona’. But now she has launched a project on the fundraising website, Kickstarter, to hold the first exhibition, Las Calles Hablan at the Mutuo Centro de Arte, involving local artists Debens, Kenor, Kafre, Tom14, Btoy, OGOCH and SM172. The exhibition is scheduled for 25th October 2012. Every city in the world has a rhythm, a natural beat that carries and guides the evolution of the place. This beat embraces the history that is stored in the streets and stones of buildings and walkways. It is in the expression of the citizens. It floats in the air thumping. 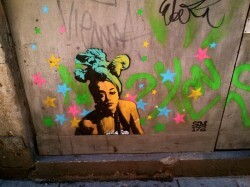 This beat cannot be any more clearly felt and more perfectly captured as with Barcelona and her public street art. For Barcelona, after the fall of Franco, the beat evolved into the Bohemian culture that has reclaimed the city and its Catalan roots. For decades, the city flourished with freedom, graffiti and music. But the recent economic and political changes have caused the (Spanish) government to begin removing freedoms from the people, reversing these modern cultural advances. New laws and fines to public street artists are threatening the very vein of Barcelona culture.No successful conversations between the artists and the city council have taken place to preserve these public spaces where the people can express themselves in a visually stunning medium. Graffiti serves to create a conversation between the artist and the public. It can be a playful interchange or one that may provoke question about a variety of political or socioeconomic issues. Las Calles Hablan will showcase works by some of Barcelona’s best street artists, and serve to open up dialogue in the community about the importance of street art. By providing people with information on the various barrios and their history, we serve to create an open forum that will not only provide an arena for artists, locals and officials, but also progressively educate citizens and protect the relationship of Barcelona to its most valued cultural contributors. 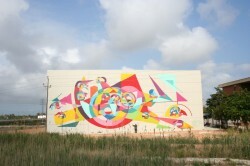 Mapping Barcelona Public Art is raising funds towards putting on an exhibit at Mutuo Centro de Arte in October 2012 in Barcelona, Spain. The funds will go directly into putting on the exhibit (rent for gallery, set up, publicizing) and maintaining website that will have continual information updates and photographs of the Barcelona street scene. If you like Barcelona street art then do check out the project and consider supporting this exhibition. I know Katrine has worked very hard on it and every little bit helps. And don’t worry, if the full amount isn’t raised you get your money back. Check out the promo for the documentary to be screened at the Las Calles Hablan event.